This article is about the year 1802. For the microprocessor, see RCA 1802. For other uses, see 1802 (disambiguation). 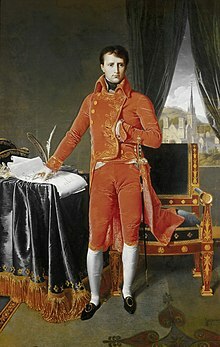 August 2: Napoleon is confirmed as the First Consul of France. 1802 (MDCCCII) was a common year starting on Friday of the Gregorian calendar and a common year starting on Wednesday of the Julian calendar, the 1802nd year of the Common Era (CE) and Anno Domini (AD) designations, the 802nd year of the 2nd millennium, the 2nd year of the 19th century, and the 3rd year of the 1800s decade. As of the start of 1802, the Gregorian calendar was 12 days ahead of the Julian calendar, which remained in localized use until 1923. January 5 – Thomas Bruce, 7th Earl of Elgin, British ambassador to the Ottoman Empire, begins removal of the Elgin Marbles from the Parthenon in Athens, where they are at risk of destruction during the Ottoman occupation of Greece; the first shipment departs Piraeus on board Elgin's ship, the Mentor, "with many boxes of moulds and sculptures", including three marble torsos from the Parthenon. January 15 – Canonsburg Academy (modern-day Washington & Jefferson College) is chartered by the Pennsylvania General Assembly. January 29 – A French expeditionary force (40,000 troops) led by General Charles Leclerc (Bonaparte's brother-in-law) lands in Saint-Domingue, (modern Haiti) to restore colonial rule, where Toussaint Louverture (a black former slave) has proclaimed himself Governor-General for Life, and established control over Hispaniola. February 3 – French Army General Charles Leclerc and the first 5,000 of 20,000 troops arrive at Cap-Francois (now Cap-Haïtien), to suppress Toussaint L'Ouverture and the rebellion of the black population in Haiti. February 17 – The remains of Pope Pius VI are returned to the Vatican by France; the Pope had died in captivity at Valence, on August 29, 1799. February – The Rosetta Stone is brought to England by Colonel Tomkyns Hilgrove Turner, who arrives at Portsmouth on the captured French frigate L'Egyptiane. March 3 – Ludwig van Beethoven publishes his Piano Sonata No. 14, commonly known as the "Moonlight Sonata" (Mondschein), in Vienna; the availability of the sheet music is announced by Giovanni Cappi in the newspaper Wiener Zeitung. March 11 – The Rosetta Stone is presented to the Society of Antiquaries of London, which in turn presents it to the British Museum. March 16 – The United States Army Corps of Engineers is re-established, and the United States Military Academy at West Point, New York is established under its management, opening on July 4. March 25–27 – Napoleonic Wars: The Treaty of Amiens between France and the United Kingdom ends the War of the Second Coalition. March 28 – H. W. Olbers discovers the asteroid Pallas. April 10 – The Great Trigonometrical Survey of India begins, with the measurement of a baseline near Madras. April 26 – A general amnesty signed by Napoleon allows all but about 1,000 of the most notorious émigrés of the French Revolution to return to France, as part of a conciliatory gesture to make peace with the various factions of the Ancien Régime, that ultimately consolidates his own rule. May 19 – Napoleon Bonaparte establishes the French Légion d'honneur (Legion of Honour). May 20 – By the Law of 20 May 1802, Napoleon reinstates slavery in the French colonies, revoking its abolition in the French Revolution. May – Madame Marie Tussaud first exhibits her wax sculptures in London, having been commissioned, during the Reign of Terror in France, to make death masks of the victims. The United States Patent and Trademark Office is established within the Department of State. At Huế, shortly before his conquest of Tonkin, Nguyen Anh is crowned as the Emperor Gia Long, the first ruler of the Nguyễn dynasty in Vietnam. June 2 – Indigenous Australian Pemulwuy, a leader of the resistance to European settlement of Australia, is shot dead by Henry Hacking. June 8 – Haitian revolutionary Toussaint Louverture is seized by French troops, and imprisoned at the Fort de Joux. June – Humphry Davy publishes the first account of the experiments by Thomas Wedgwood in photography, in the Journal of the Royal Institution, in an article titled "An Account of a method of copying Painting upon Glass and making profiles, by the agency of Light upon Nitrate of Silver. Invented by T. Wedgwood, Esq. with Observations by H. Davy. Since a fixative for the image has not yet been developed, the early photographs quickly fade. July 5 – Parliamentary elections begin in the United Kingdom, with voting continuing until August 28; the Tories, led by Henry Addington, win control of the House of Commons. July 19 – Éleuthère Irénée du Pont founds E. I. du Pont de Nemours and Company, the modern DuPont chemical company, as a gunpowder manufactory near Wilmington, Delaware. July 22 – Gia Long captures Hanoi, completing his unification of Vietnam. August 2 – In a plebiscite, Napoleon Bonaparte is confirmed as the First Consul of France. September 3 – William Wordsworth composes the poem Westminster Bridge in London. September 11 – The Italian region of Piedmont becomes a part of the French First Republic. October 2 – War ends between Sweden and Tripoli. The United States also negotiates peace, but war continues over the size of compensation. October 15 – French Army General Michel Ney enters Switzerland with 40,000 troops, on orders of Napoleon Bonaparte. October 16 – The port of New Orleans and the lower Mississippi River are closed to American traffic by order of the city's Spanish administrator, Juan Ventura Morales, threatening the economy in the western United States, and prompting the need for the Louisiana Purchase. December 2 – The Health and Morals of Apprentices Act in the United Kingdom comes into effect, regulating conditions for child labour in factories. Although poorly enforced, it pioneers a series of Factory Acts. ^ Coleman, Helen Turnbull Waite (1956). Banners in the Wilderness: The Early Years of Washington and Jefferson College. University of Pittsburgh Press. p. 206. OCLC 2191890. This page is based on the Wikipedia article 1802; it is used under the Creative Commons Attribution-ShareAlike 3.0 Unported License (CC-BY-SA). You may redistribute it, verbatim or modified, providing that you comply with the terms of the CC-BY-SA.